Review posted August 8, 2018. Balzer + Bray, 2016. 397 pages. 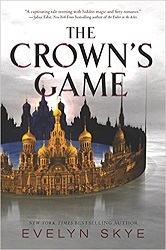 This book is about a magic duel in Imperial Russia. Russia has always had magic, but over time it is hidden, and the people don't believe in it. But the tsar needs an Imperial Enchanter, who draws on the magic of Russia. However, there can only be one, or they will dilute the magic. The magic needs to be concentrated. The Game is a display of skill and a demonstration of strategy and mettle. The goal is to show me your worthiness to become my Imperial Enchanter -- my adviser for all things from war to peace and everything in between. Each enchanter will have five turns, at the most. As the judge, I may declare a winner at any point in the Game, or I may wait until all ten plays have been made. Remember, your moves will reveal not only your power but also your character and your suitability to serve the empire. Impress me. So the two enchanters start the Crown's Game. Besides impressing the tsar, they can end the game by killing the other enchanter. At the end of ten moves, if both are still alive, the tsar will declare a winner. The other will be incinerated by the brand placed on each enchanter at the start of the game. So Nikolai and Vika begin the work they've trained for all their lives. Neither one expected to find a kindred soul in their opponent. It shouldn't be a surprise, since never before has either one met someone who can work with magic like they can. But there is only room for one Imperial Enchanter. The book gives the flavor of Imperial Russia. Nikolai has grown up in fashionable Saint Petersburg, a friend of the son of the tsar, mentored by harsh and power-hungry Galina. Vika grew up out in the country, learning how to manipulate nature from her kind mentor Sergei. For the first time, both are going to show their magic to the world.